View More In Salad Servers. The Michel Design Works Melamine Serveware collection is as stylish and substantial as porcelain, but much easier to care for! 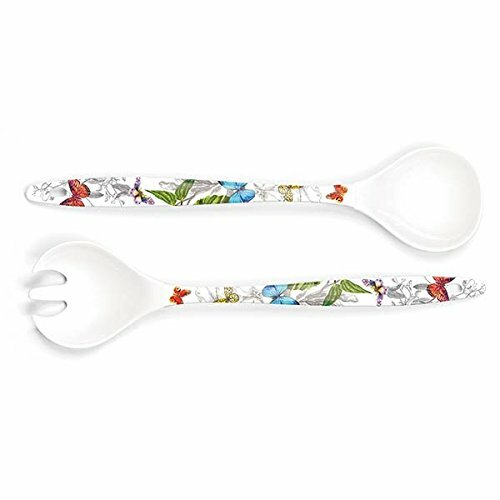 Made of lightweight melamine, it is durable and versatile - it can be used indoors and out, it is more resilient to drops and dings than porcelain or ceramic and best of all, it is dishwasher safe. The non-porous surface is naturally antibacterial and BPA-free. The collection features a wide array of indispensable pieces - bowls and platters, trays and utensils - all in coordinating designs that are truly works of art. They make the perfect gift for Mother's Day, birthdays, graduations, housewarmings, weddings or surprising a gracious hostess with something special! Created by Bruce & Deborah Michel in the early 1980s, Michel Design Works' paper goods, trays, tinware, and melamine allow you to set a beautiful table without a lot of fuss. Best of all, they are as easy to care for as they are elegant. Making this kind of hospitality simple and fun is a big part of what we are all about. And look beyond the dining table to fully experience the Michel Design Works brand. We welcome you lather up with our English soaps, enjoy the ambiance of our scented candles and end your day with a wonderfully fragrant bubble bath.